With each of the division's 12 clubs having played each other three times, they have been split into a top and bottom six, with the teams in each section all set to face each other once as the title, relegation and European qualification are decided. 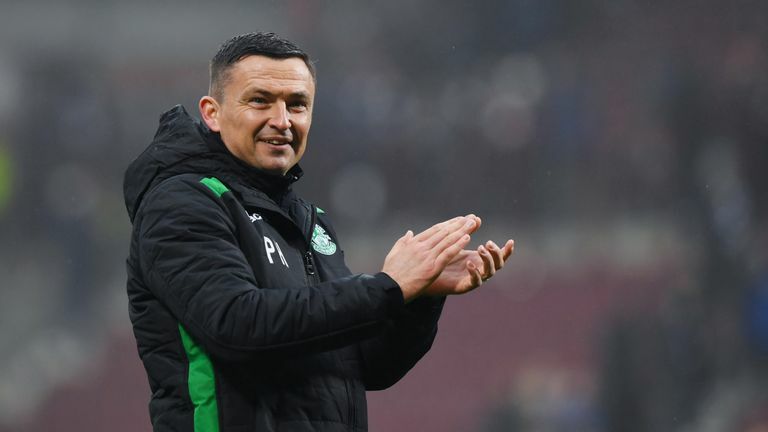 Hibs have gone an eight-game unbeaten run in the league since Heckingbottom was appointed midway through February, which has lifted them to fifth and within six points of third-place Kilmarnock as they prepare to face league leaders Celtic on Sunday. "It looks a long, long way and of course it is," Heckingbottom said of the gap. "We're not kidding ourselves, but I think with that format, it is different because you're playing all the top teams. "It's quite easy for a team not to pick up points or not to pick up many points. "And then flip that, if you get results that people don't expect you to get; i.e. Sunday, you can gain a head start on everybody else." A third-place finish would guarantee Hibs a place in Europe next season, while fourth would be enough in the case that Celtic beat Hearts in next month's Scottish Cup final. Regardless of whether or not Hibs achieve that, Heckingbottom believes having made it into the top six will provide him with valuable information for next season. "That was sort of our goal when we came in. We had a lot of work to do to catch up," Heckingbottom said. "You've got another derby, you've got to play all the top teams, so you're going to be playing in front of full houses." "Teams are playing for things, whether it's chasing Europe or to win the title. "That was the reason, from a purely selfish point of view, to see how we manage and how we cope in these big games, because we want to be up there challenging next season. We want to be up there pushing these boys."